John Carpenter‘s loose remake of the sci-fi classic “The Thing From From Another World” has grown to be a favorite for many horror fans through the years. Some even call “The Thing” Carpenter’s best work. I beg to differ, as you’ll find out somewhere in the Top Five of this list. “The Thing” tells the story of a group of men at a research facility in Antarctica who are being terrorized by a shape-shifting alien. This nasty creature doesn’t just kill his victims, he becomes them. Which allows the alien to trick the others into falling prey. What sets this movie apart from most of Carpenter’s other films is that he tossed aside his trademark subtlety. The gore, monsters and frights are all in your face with a little help from Rob Bottin’s special effects. The movie, which triples as a horror/action/sci-fi movie, might not be the best horror movie, but it’s definitely the best alien-invasion movie (which we’ve already deemed in an earlier post). Did You Know? 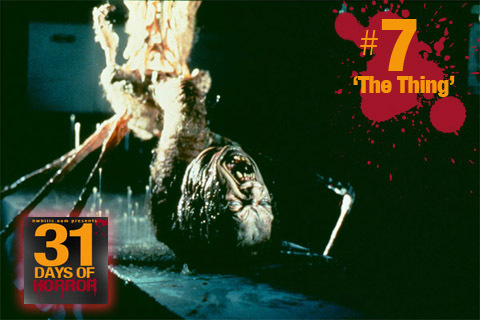 “The Thing” was released two weeks after “E.T.” Moviegoers continued to prefer the sweet innocent alien to the nasty killer one. “The Thing” pretty much failed at the box office.